I just returned from a five day trip in Upstate New York. It was wonderful! I had the first experience of real autumn with its magical fall foliage. Rochester was a cozy town. The pace is a lot, a lot slower than San Francisco. I had some good eats in Rochester but the food scene is slim pickings. In fairness, I was also limited to downtown Rochester and did not have access to a car that would have enabled me to explore further. So, I had an awesome meatball sandwich from a deli (New York is known for its delis), avocado toast at a great new school eatery that serves seasonal and fresh food, and ribs and fixins at Dinosaur BBQ which I was told to put on my Rochester Bucket List. I dined on greasy airport food for the rest of my trip. My stomach was shot all throughout my trip. I missed fresh veggies, plain rice and comfort food! I do not even eat rice everyday but my diet is often meat-free and fresh (regardless what my Instagram shows. Those are rare treats!) I really needed a meal that is comforting not just to my tummy but one that comforts my spirit after a brutal 9 hour flight back home! Then arriving at almost 11 pm to the smoky Bay Area because of the wild fires! The next day after putting the dirty laundry and luggage away, making a nice brunch from Mr Sweetie whom I missed so much, I cooked myself a pot of steaming jook or Chinese rice porridge. I devoured this silky, savory comfort food in my old pj's and with a cup of sweet, creamy coffee! I am happily, blissfully home at last! So, you ask me, "what is jook?" Americans and Europeans have oatmeal or sweet porridge. In the Philippines I grew up eating arroz caldo (chicken rice porridge with ginger and green onions). We probably got this from Spain. We also have goto (rice porridge with pig intestines). It is often served with a side dish of crispy deep-fried tofu in vinegar, soy sauce and chili peppers. This dish was probably brought to the Philippines by the Chinese who were already residing in the Philippines way before the Spaniards came to conquer in the 1600s. Jook or congee is Chinese/Asian rice porridge. 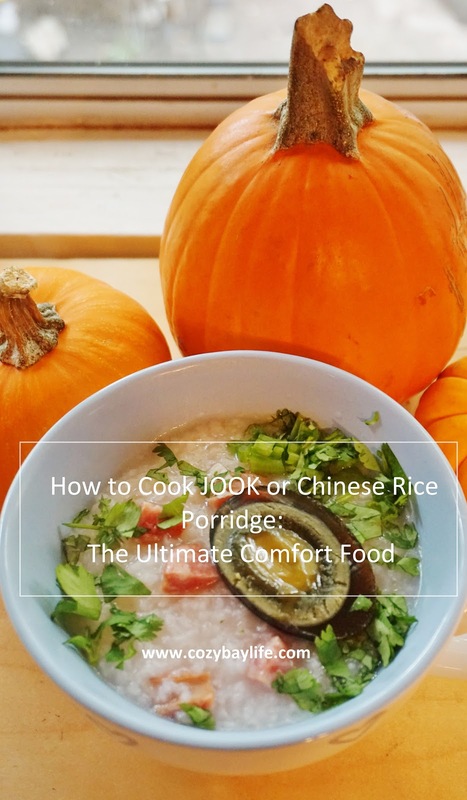 The difference between the Filipino version and the Chinese porridge is that jook is less thick and more silky, whereas the Filipino lugaw is pretty thick and hearty. Jook is the easiest thing to cook. There are variations all over the web including recipes that include chicken or turkey. (Perfect for the Thanksgiving turkey leftover!) I have learned the tricks from my friends from Hong kong and China in making the silkiest porridge. Their version (and mine) is the simplest one ever. You only need jasmine rice, water and ginger. You can put the kitchen sink in your jook bowl after you are done cooking. It is really up to you. But if you really must cook it now it is okay to not pre-soak the rice. Just put a little bit of oil to make it silky. (I prefer EVOO). Boil the rice, ginger and water together. Then simmer for about 45 minutes to 1.5 hours until thick and creamy. Discard the ginger. Now this is the fun part. It is really up to you what you want to put in your jook after it cooks. Restaurants specializing in jook such as my favorite one in Oakland Chinatown offer a variety of jook combinations on the menu. Century eggs are a must for me but you do not need to put these in order to enjoy yours. These gelatinous dark-green preserved duck or chicken eggs make the porridge very rich and creamy. I should warn you that it is an acquired taste and texture if you did not grow up with it or not a very adventurous eater. FUNNY CHILDHOOD STORY: My foodie dad brought these eggs home one day when I was about 8 years old. My 7 year old brother cried after he had a bite and demanded that he brushed his teeth that very minute but I was hooked since! Chinese sausage (these sausages are salty/sweet and delicious!) They are mostly imported from Asia but I found fresh ones at Asian Markets in the Bay Area. Chili oil | Soy sauce| Fish sauce | Sesame oil | White pepper | Green onion | Cilantro | Roasted peanuts. You can tell from the pictures that I put sliced Chinese sausage, century egg, sesame oil, crushed pepper flakes, green onions and cilantro in my jook. So comforting and so delicious! The best part – jook is healthy, costs pennies to make and will make you feel better right away! If this is too wild for you, omit the century egg and Chinese sausage. Put mushrooms, veggies, chicken, boiled eggs, etc. Trick is to season it well with salt or soy sauce. Otherwise, this will be bland which what makes this great for tummy troubles. I feel so much better. I am now cozily under the covers on the couch looking at my beautiful fall photos of my trip to New York while Mr Sweetie is sleeping right next to me. Have a cozy rest of the fall season!